Delving into Turkey’s political playing field, this book examines how an ethnic party increased its vote shares. The case study looks at the rise of the Kurdish party in Turkey’s 2011 national elections, in relation to the mainstream political parties‘ strategies. The research explores the strategy of the dominant Justice and Development Party that garnered the majority in three consecutive elections, introduced a new political issue, and even initiated an opening process. Investigating the reasons behind why such a dominant party would put itself at risk with this bold strategy and why it still lost votes to the ethnic party in the process, the book traces Turkey’s handling of the Kurdish issue. Combining a detailed analysis of election results, speeches, and social survey findings, the volume offers a novel approach and a rare example of the application of process-tracing methodology. Additionally, the study is one of the first to utilize unsupervised model-of-scaling texts on the ethnic issue dimension. 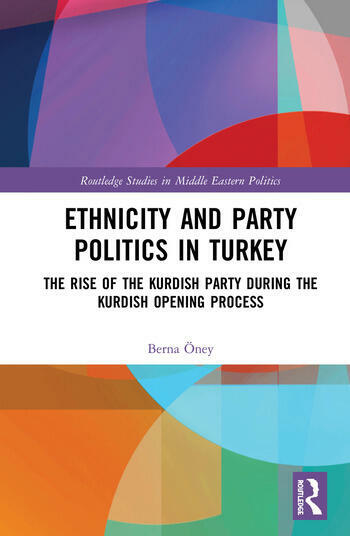 As the first systematic analysis of the Kurdish opening process, the book will be of interest of students and scholars researching in qualitative methodology, text analysis, ethnic and party politics, Turkey, and the Middle East. 2. Data & Methodology: How to apply explaining-outcome process-tracing to the Kurdish opening process in 2009-2011 in Turkey? 4. Why did the AKP enter the ethnic issue dimension when initiating Kurdish opening process? Berna Öney is a postdoctoral researcher at the Social Sciences Institute at University of Oldenburg, where she also received a PhD degree. Her research interests include democratization, party politics in new democracies and ethnic politics. Her publications appeared in Turkish Studies, Ethnicities and Mediterranean Quarterly.